Diedre, the dragon, didn't have any friends. She lived by herself in a dark cave at the top of a tall mountain. Because she only ate things like wild rats and bats, she was too skinny. This made her feel sad all the time. Soon she broke through the clouds and saw a wondrous sight. Trees, flowers, and grass grew everywhere. She saw birds, horses and other animals. “Look at all these animals. I'm sure I can get one of them to be my friend.” Down she went, lower and lower until she landed in a field of tall grass. An elephant ran past her. “Excuse me, Mr. Elephant, but would you be my friend?” Diedre ran after him, trying to stop him. “I'm a dragon. I need a friend.” Diedre went on to tell Mr. Elephant about how lonely she was in her cave. “You can be my friend and I'll introduce you to some of the others. Follow me.” Mr. Elephant led Diedre into a large grassy field. A cat, several mice, a dog, goat, moose and hippopotamus came running over to them. “I'll be your friend,” said the cat. “We'll be your friend,” said the mice. “Me too,” answered the goat. 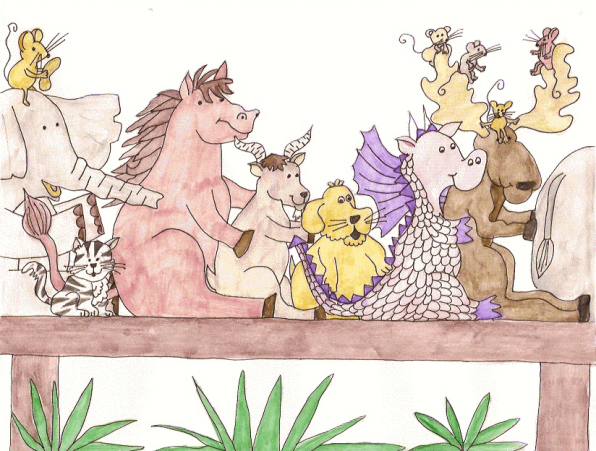 The horse, dog, moose and hippopotamus all said they'd be Diedre's friend. They spent the entire day playing games, like hide and seek and tag and hopscotch and marbles. Diedre had so much fun! After they'd finished playing she began to feel a little bit hungry. “Excuse me, Mr. Elephant, but I'm hungry. What do you have to eat down here?” Diedre licked her lips. “I eat peanuts,” said Mr. Elephant. “I eat hay and so does the goat,” said the horse. “We eat cheese,” squeaked the mice. “I eat fish,” answered the cat. “We don't have any of those down here. You'll have to go back to the mountains if you want to eat wild rats and bats,” said the hippopotamus. Diedre never went back to the mountains. She never ate another wild rat or bat again. She stayed in the valley with her friends and nibbled on all the different types of food they offered her.